After a breach of protocol in bashing his hosts, Trump was on his best behavior as he wrapped up the visit, insisting the U.S.-U.K. relationship is at “the highest level of special” before dropping by Windsor Castle for tea with the queen and heading off for a weekend at one of his golf courses in Scotland. He left a trail of double-talk and chaos that has become a pattern in the U.S. president’s recent overseas travels. “I didn’t criticize the prime minister,” Trump said. “I have a lot of respect for the prime minister.” He blamed the newspaper for skipping over his praise of May in a piece that was published Thursday just as the prime minister played host to Trump at an opulent welcome dinner at a country palace. In the interview, Trump criticized May’s plan for Brexit and said it may cause a proposed U.K.-U.S. trade deal to collapse. He questioned her competence just as her government is in turmoil from contentious negotiations on how Britain will leave the European Union. The president’s bombast at Chequers was offset by a rare moment of delicacy hours later, when a chauffeured Range Rover took Trump and first lady Melania Trump to the courtyard of Windsor Castle, where Queen Elizabeth II was awaiting them under a canopy on a dais. Up to 100,000 people massed in London for demonstrations against the president’s visit. Marchers gathered in central London before walking through the center of the city to Parliament — where earlier the 20-foot (six meter) baby blimp hovered overhead. Many protesters used humor to convey their opposition. One sign read “Trump wears poorly tailored suits,” another proclaimed “Overcomb Brexit.” One man was selling rolls of “Trump toilet paper” emblazoned with a picture of the president. 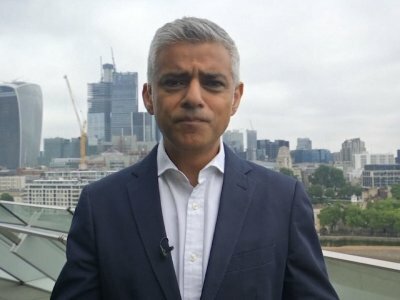 London Mayor Sadiq Khan says it's important to celebrate free speech, and the protests in London are a part of that.